The Bottom Line: A brilliantly executed assassination thriller that is perfect for fans of L.T. Ryan, Vince Flynn and Barry Eisler. Hollow-Point Diplomacy begins in picturesque Argentina, as a trio of elderly Nazi fugitives gather to celebrate Hitler’s birthday, drink, sing and reminisce about their glory days in the Third Reich. Their annual night of revelry, however, and decades of freedom are brought to an abrupt end by the arrival of a decisive stranger who needs just three well-placed shots to avenge their long-dead victims. The hard-hitting opening scene is a perfect introduction to Travis Delta, the American assassin at the heart of R.H. Johnson’s Hollow-Point Diplomacy (eponymously named for the type of bullet Delta favors, which expands upon impact for maximum destructive effect). Delta is a former Navy Seal who, when he’s not working for a strike operations contractor called Snakedriver, lives on a massive spread of pristine Alaskan wilderness. The majesty of his estate, dubbed “Heaven,” is painted so gloriously by Johnson that you almost regret Delta’s inevitable call to duty. Even before Delta can answer his satellite phone, we know – Johnson alternates Delta’s point of view with those of his enemies throughout the book – that the Ayatollah of Iran and Russian President are engaged in secret meetings that won’t be good for the United States or its allies. The succeeding chapters put Delta and Snakedriver in a winner-take-all battle for the future of Eastern Europe and the Middle East. Overall, Hollow-Point Diplomacy is – despite the presence of old Nazis in the first chapter – a thriller for our times. In an era where distrust between the United States, Iran and Russia is arguably worse than it has been in many years, the storyline feels fresh. Throughout, Johnson’s prose crackles with lush landscape and character descriptions, giving the novel a decidedly cinematic feel. As the book hurtles toward an unforgettable climax, Johnson elevates the narrative with a fully baked intelligence and military ecosystem that will impress even the most hardened thriller fans. 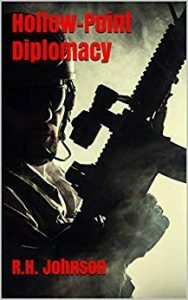 The novel’s sophisticated understanding of geopolitical tensions, along with some genuinely fresh plot twists, make Hollow-Point Diplomacy a winner.